Thames Valley Police is launching phase three of its Hidden Harm campaign today (2/7), reminding people that culture and tradition are not an excuse for abuse. Thames Valley Police is proud to be working with partners in policing this year’s Royal Regatta. 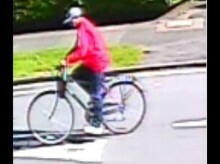 Thames Valley Police has released a CCTV image of a man who may have vital information in connection with a burglary in Reading.